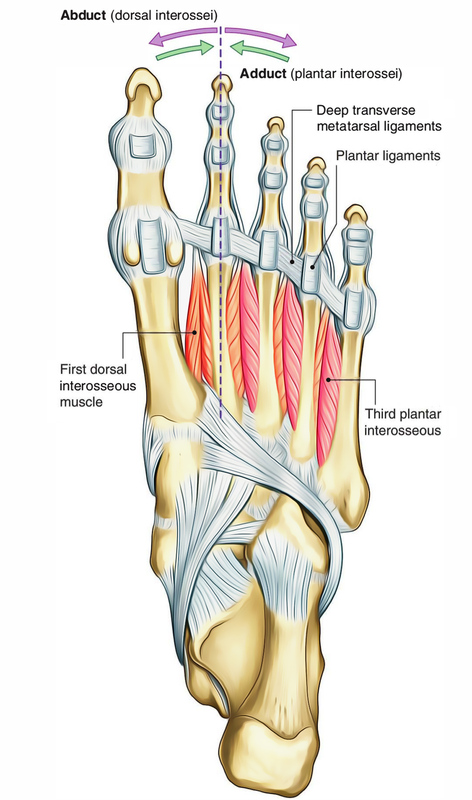 The third, fourth, and little toes toward the long axis through the second toe are adducted by plantar interossei muscles. The medial side of its associated metatarsal serves as point of origin for each plantar interosseous muscle. The medial free margin of the extensor hood and base of the proximal phalanx serves as the point of entrance. The second toe by using, among one of its dorsal interossei is adducted back to its longitudinal axis and the great toe has its own adductor muscle (the adductor hallucis) in the sole of the foot in the third layer of muscles. The plantar interossei are found in the lateral three inter osseous spaces and are smaller than their dorsal equivalents, fusiform in shape. From the plantar and medial aspect of the base and proximal end of the shaft of the metatarsal each plantar interrosei originates. To insert into the medial side of the base of the proximal phalanx of the same toe, the tendon that is created passes forwards and deep to the deep transverse metatarsal ligament. In English language this muscle’s name stands for the name of the muscle between the bones on the sole of the foot. The Latin word planta for “the sole of the foot,” which originates from the Greek plata meaning “flat” is, where the word plantaris generally originates from. The fourth interosseous space is supplied by the superficial branch of the nerve. The skin covering the area is supplied on the lateral side by root S1 and medially by root L5. The plantar interossei adduct the third, fourth and fifth toes in the direction of the second. In conjunction with the dorsal interossei they flex the metatarsophalangeal joints of the lateral three toes. With the help of the dorsal interossei and the abductor digiti minimi, the plantar interossei help to control the arrangement of the third, fourth and fifth toes during the push-off phase of walking and running. When weight is suddenly applied to the forefoot they also help to prevent splaying of the toes.